In 1980, China launched its national one-child policy, in response to both a huge concern about the prospects of rapid population growth impacting on resources and a desire to increase GDP per capita. After the relatively loose but very successful policy of the so-called ‘later, longer, fewer’ campaign of 1972-79 (referring to later childbirth, longer spacing between childbearing and fewer children overall), a stricter birth control policy was introduced. China’s total fertility rate, which had already declined from 5.8 in 1970 to about 2.7 in 1979, fell to 1.5 and lower in the 2000 and 2010 censuses. However, this also resulted in a large number of families with only one child, among whom one to two million subsequently died, when it was too late for their parents to have another child. Apart from the emotional loss, such a tragedy may well have serious economic implications for ageing (former) parents in a land with virtually no pension system for a large segment of the population, and parents who have traditionally relied on children’s support in old age. The number of these “bereaved” parents is increasing annually. The majority attribute their status (loss of their only child) to their compliance with the enforced national birth control policy, and now expect some compensation. They have received some support from both national and local institutions, but the amount is woefully meagre and inadequate. Protests surface now and again, but the problem is yet underexplored, and likely to mount in the future. Even though the mortality level in China is generally low, the probabilities that an only child will predecease his/her parents are not inconsequential. 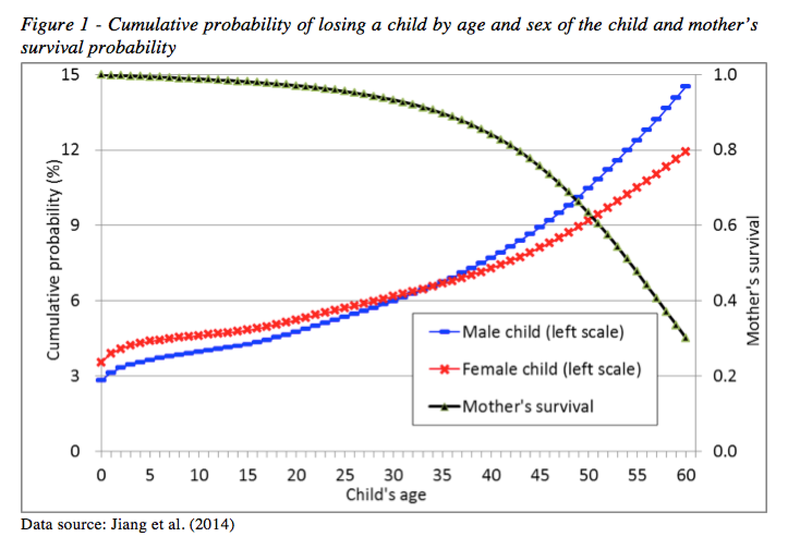 According to a simulation estimate based on China’s 2000 census data, the cumulative probability of a child predeceasing the mother is about 15% for a son and 12% for a daughter if the mother survives until her child reaches age 60 (Figure 1). But there is also an urban-rural difference. For a city mother, the cumulative probability of her child predeceasing her is 11% for a son and 8% for a daughter; for a township mother, these probabilities increase to 14% and 10%, respectively, and reach 17% and 14% for a rural mother (Jiang et al., 2014). It is estimated that around one million women aged 49 and over have lost their only child, and the aggregate death toll of only-children may reach 11.8 million by 2050 under the 1.5-child policy¹ that was in force until recently (before the policy reform of 2013), with concomitant rises in the number of bereaved parents (Wang, 2013). 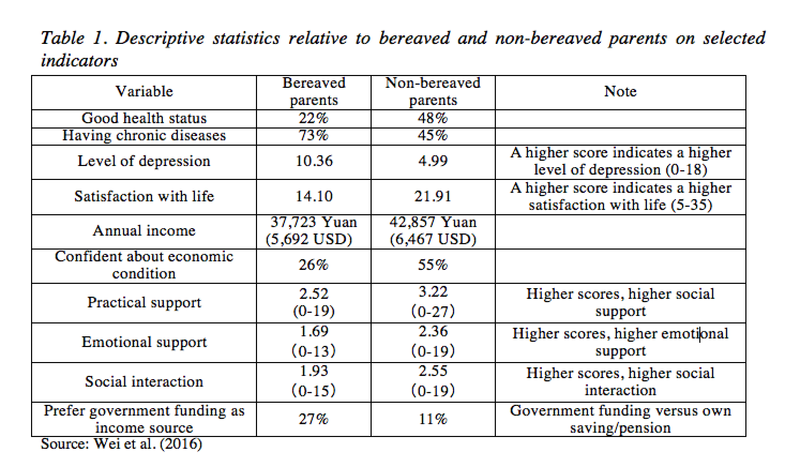 We examined the vulnerability of bereaved parents using data for 282 non-bereaved parents with only one child, and 194 bereaved parents drawn from the survey on Development Capabilities of Families Practicing Family Planning in the Context of an Ageing Population conducted jointly by Xi’an University of Finance and Economics and the Xi’an Population and Family Planning Commission in July 2013 in Xi’an. The descriptive results of Table 1 are confirmed in regressions – i.e., controlling for other covariates (see Table 3 in Wei et al. 2016): bereaved parents are in disadvantaged situation. For instance, bereaved parents are likely to report poorer health in self-rated health assessments, to have more chronic diseases, and to have a higher level of depression. Moreover, bereaved parents have less practical, emotional and social support, and fewer social interactions. Finally, they often face significant economic difficulties, having invested the bulk of their savings in the success of their only child (Wei et al., 2016). These results are in line with the others, also pointing to trauma among bereaved parents and their exposure to social stigma. In the context of inadequate social protection and long-term care provision, this group of bereaved parents will face a highly insecure old-age, and they represent a rapidly growing, highly vulnerable population. China’s birth control policy was enforced nationwide, at very large social and political costs (Wang et al., 2013): everyone suffered, but bereaved parents more so than others. China’s government acknowledged this and issued some regulations to support them. In late 2013, for instance, five ministries jointly issued a directive granting them old age security, medical insurance, and a monthly support of 340 Yuan (around 52 USD) for an urban parent, and 170 Yuan (around 26 USD) for a rural parent aged 49 and above. This directive also requires all kinds of social and government organs, especially grassroots family planning associations, to offer support to bereaved parents, although no concrete operational measures are mentioned. Some provinces have raised their financial support: in Shaanxi province, for instance, it is 1,000 Yuan (around 160 USD) and 800 Yuan for an urban / rural bereaved parent aged 60 and above. In short, without a sound old-age security system, Chinese elderly people depend mainly on their children for their old-age support. The issue of bereaved parents will remain on the economic and political agenda of Chinese leaders for many years to come. Gu, B., F. Wang, Z. Guo, and E. Zhang. 2007. 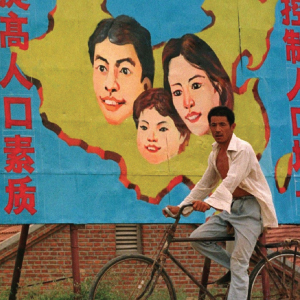 China’s local and national fertility policies at the end of the twentieth century. Population and Development Review 33(1): 129-147. Jiang, Q., Y. Li, and J.J. Sánchez-Barricarte. 2014. The risk of mothers losing an only child in China. Journal of Biosocial Science 46(4): 531-545. Wang, F., Y. Cai, and B. Gu. 2013. Population, policy, and politics: How will history judge China’s one-child policy? Population and Development Review 38 (suppl): 115-129. Wei, Y., Q. Jiang, and S. Gietel-Basten. 2016. The well-being of bereaved parents in an only-child society. Death Studies 40(1): 22-31. ¹ A somewhat relaxed version of the one-child policy, under which urban couples can have only one child, but rural parents can have a second child if the first child is a girl. There were also other exceptions, e.g., for ethnic minorities. For a detailed discussion, see Gu et al. (2007). Since 2015, China has officially abandoned its one(-and-a-half)-child policy and adopted a new one, allowing two children per couple. ² The rest comes from capital, alimony, and other, unspecified sources.